Date(s): 2010. Photos by Aymar. 1 - 55 of 55 Total. 12042 Visits. The two story Sebastianskapelle can be just made out beside the tower of the Martinskirche. The Sebastian Chapel from 1474. The tympanum shows some kind of vetting. Summer school or something more sinister. (Just hold your score sheet upside down. Sometimes you will get away with it.) - The judgment motive is probably appropriate. The ground floor of the chapel served as charnel house (suspect that it was more some kind of a morgue, not much room for bone bins). Some Bubonic Plague aftershocks. Codename: arrows from the sky. With quarrels and fleches. Could be worse. At least there is somebody in charge. Some props have been removed. Most sculptors improvise when it comes to sundials, Daiquiri sticks and pincushions. Holds also for Greek statues of flying kites. - The reddish sandstone is very much in evidence in all the monuments of the region, sacral or temporal. Twin born from the selfsame quarry, something like that. Possibly Keuper. Stained glass window of the upper floor chapel. As so often a 20th century replacement. Original stained glass windows are rare. A Holy Supper (fire motive) in the opposite window balances the actinic blue colors of the adoration theme. - With some technical reservations: at the focal center of a laterna magica round up. Some omnivision aspects. The Neogothic Martinskirche (early 20th century). It is not as hopeless as it may sound. In Intel terms: Riemenschneider inside (so you can find it without making too much of a nuisance of yourself). - Zoom in: With spider webs and stalks of grass it is dew drops, with auxiliary spires and pinnacles it is crockets. Westering sun. The business end, choir, is in opposition. An impeccably whitewashed house does 'ram' the starboard side of the nave from this vantage point. It did look marginally better after I curtailed it evenly on both sides. Whatever you can save of the underlying symmetry. The old inn (freely, Happy Tankard) which was also the coach station. Built in 1578. Courtesy of the selfsame Westering sun. Looks like some kind of flag day. Out on a limb (usual caveat, open to revision): 12th century Bischofsheim did join the free imperial city club, however briefly. The Staufer were liberal enough with their township charters. The red and white in the town flag (townships as fiefs) will date back to that time. Bischofsheim was in the end reabsorbed into the feudal mainstream (it just amounted to a lower place in the pyramid). A common enough fate (Markgröningen). Incidentally, the respective positions were somewhat reversed in Northern Italy where the Popes were most often the sponsors of the municipal freedom fighting. - The spoked wheel is from the historic flag of Kurmainz. Field [gules] with, as charge, a flying space station [or]. Not sure about the Däniken touch. Just hope I got the tinctures right. There you live peacefully in the 13th century and then you open your front door and see this. - The channel did once feed the moat around the Kurmainzer castle. Usual freeloaders (undershot waterwheels). No detectable current. Suspect some closed sluice gates. Better late than never. Outdoor exhibit. I do not know what is so remarkable about a Republican state within a Republican nation (Weimar). The reverse would have made for a far more interesting situation. The emigrants who had left the country in droves after 1849 never came back. Immodest John (technically: quillons centered). - Somebody forgot to spray paint the fork lifters. - The forester jacket foreshadows the coloring of the 18th century infantry greatcoat of the Kurmainz army. A vanitas vanitatum plaque. The spelling is rather hard on the eyes (they should dry (try) that with traffic sihns). Particular Julius Zehnder wisdom: only houses built with a higher permit (probably recourse loan related) will endure (think children and sand castles). 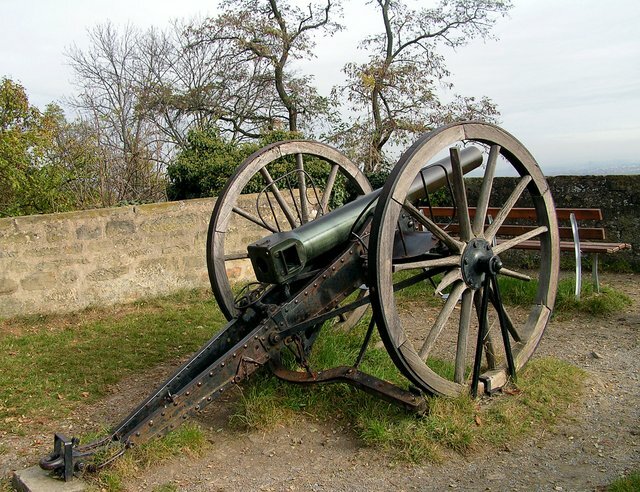 Field artillery (6 pounder range). Best guess, 18th century, Napoleonic era at the latest. Telltale features, the fuse hole (whatever you can spike), the brass pinions and the carefully jointed carriage. 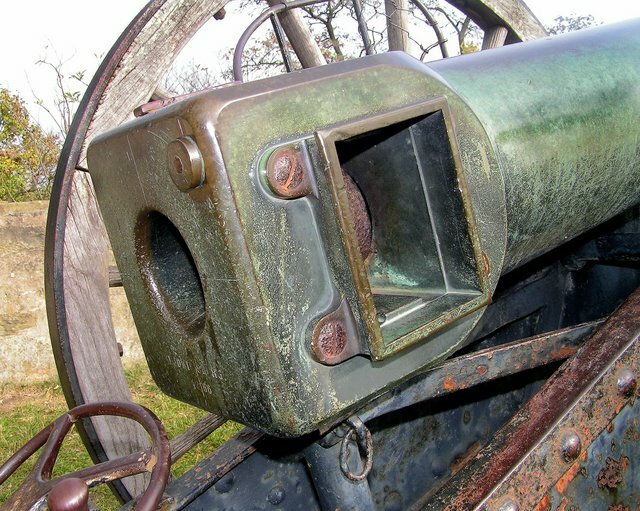 The breech loading field guns of the second part of the 19th century were far more advanced. Reminder: internal combustion engines were just around the corner. The museum leaflet confirmed my initial suspicions: town canons from 1750. Why do you only find the correct answers after you have figured it out for yourself. The corner faces (previous picture) are reserved for officers. Rank has its privileges. By quick count: the number of deaths does not agree with the previously given figure. 239 dead, but that will have been the toll for the whole war (for Württemberg). The names of not yet incorporated suburbs are added in some cases to the place of birth. - The feathers are absent in subsequent Franco Prussian and Grand War monuments. Unique feature as far as I can tell. The picture shows the Roman Catholic memorial service from 1890. The Armada building was already in progress at the time. - Source, Archivbilder, Tauberfränkische Heimatfreunde, ISBN : 978-3-89702-895-1. The book picture is of much better quality. Memorial service from 1966. The region still hosts a substantial amount of Bundeswehr. Faded Cold War script: Somebody had to protect the bank towers of Frankfurt. Somewhat resigned: why an army at all if the threat of an external expropriation, the only reason why it was allegedly set up in the first place, has long since evaporated (even as the hard currency). The alternative recruitment office (tentatively, Rimbaud versus Kipling). Expanded: you want to see poppy fields, go into the car export business like everyone else. - No perfect fit, just the best I could come up with on short notice. Tauberbischofsheim is obviously not Munich. Most dealerships do not cater for long haul business and most buyers prefer to do their own driving. Convoy driving is rather the exception. Also a good example for the EEC law of unintended consequences. Stricter cat-conversion rules, strong tax incentives for upgrades, are always good for export. The whole trade will obviously dry up once politicians move in to make everything so much better. - Name reference, seashells by the sea. Amateur formatted pdf, whatever you can lump together. As far as I can make it out: Anno Domini 1631, .. (name, place?).. Ave Maria pray for.. (more names). Particular parsing problem: the ghost of a missing conjunction. Praise and a request for intercessory prayer. Hail Mary and while we are at it please do not forget... Nothing more specific. Whatever would be most propitious for the particular circumstances. Maybe a threatened livelihood. Possibly just a blank. You were supposed to cross this bridge in Indian file (literally, no abreast walking). The fine for a violation was a hefty 3 Marks. Those Prussians did know how to make their presence felt. In fairness, the particular traffic code made some sense. The bridge is rather narrow. A church dignitary in the front garden. My personal data bank is rather blank. Fallback position, style: a certain animate bearing must be conceded. There is even a hint of gaiety. The upper house delegate exchanging last minute witticisms with his esteemed colleague. Whatever kind of peer pleading it takes to save your neck. - The inscription should be challenge to any professional hacker. Rife with one letter acronyms. Pro Nobis Miserere. Hodie mihi - Cras tibi. Bruegel barn with just a hint of hip roof. It may have seen the Napoleon Wars, or even the latter part of the 30 Year War. Wattled and daubed filling between the semi-riveted carrying timbers. The lopsided aerial (vertical polarized) is somewhat more recent. Grossrindenfelds was one of the adjacent battle sites. The Hessian contingent (Austrian ally) was stationed there. - The momument of 1901 may refer to either 1870/71 or to 1866. It looks as if a great deal of care was taken not to aggravate any party. Approximately: 'Grossrinderfeld in thankful memory of its warriors'. The particular obelisk style, cuirassier armor and mounted battlefield paraphernalia, is a knockoff from Ludwisgsburg. - Backdrop, the city hall. The discreet signs advice the visitor that this is a duck pond only. No public swimming. At least there is some accuracy. Maximal water depth: 2,5 m (8 ft). No need to fathom anything in person. Pliny the Older (the yardstick and plumb line man) would have been disappointed. A Pieta in a forsythia shrub. Borderline flamboyant style. One of the 'side alters' features a clothes donation. Achatius Chapel. So named after a purged martyr-saint (legionary of the faith). Conjectural: Crusading, Dome of the Rock inspired. Frivolously, an early example for reverse engineering. In any case an octagonal, no frills statement. Like a piece of Staufer history. The 'minaret' sports Romanesque windows. The flaring out is a later enhancement. The location is sub-optimal. Prone to flooding and seeping in ground water. A sunken containing wall was added in 1908. <[>Trying to be at my best behavior, it cannot always be Mardi Gras, physical beauty can be a conduit of moral perfection. Somewhat more farfetched: the cortege (ladies in waiting) of intensely colored hydragenia may add a hint of levitation. Force is canceled out inside the nearly spherical inflorescence (umbel). no way back - The surplus? Maria statue was removed from the chapel in 1919. Tentatively: in search of appropriate Baroque lodgings. Casuistic question, can one use an actual dental cast for a votive facsimile. More molds. Educated guess, fertility related (love philters were probably not permitted). The separation between pancake makers and consecrated host irons is not always watertight. The instrument to the right is an actual wafer iron. I am not responsible for the arrangement. - In any case plenty of serrated surfaces. Not to be confused with diamond grip patterns. These are mousetraps. I needed some time to figure it out (there are room inventory lists instead of labels). Foreground, a snare model (recycled bed spring special?) Unanswered, was the securing string soaked in grease, to make gnawing it in two nearly irresistible? The battery arrangement is somewhat unusual. (How will it feel to be the last mouse to be duped.) The traps in the background are crushers. There are three and four 'cylinder' models. (Nürburgring hint, whenever you run out of motor blocks.) The smashing cubes had to be set into guillotine position. The rodent was supposed to climb into the baited 'crib'. The display does not show exactly how the fall of the pole guided 'meat choppers' were triggered. Educated guess, the sticking out 'piano pedals' were part of teeter totters. Up position, there goes the string. A mouse tag team schooled in analytic reasoning (or just Goldberg machine savvy) could have defeated the mechanism. A two cylinder model. The 'piano pedals' are hidden. Special feature, the 'menagerie' windows. The braided nylon string looks recent. - I did not come across any technically superior Prussian mouse traps.